When it comes to the size and shape of what I feel is the perfect field guide, this is it. Not too big or too little, with wonderful color photographs of all the birds. But before we get ahead of ourselves, let’s dissect this puppy and see how it works. The Introduction of this guide is similar to other guides, except in the fact that they discuss the way they use photography as a visual guide, and their justification of using photos instead of an artist rendering. This guide though makes up with how they arrange the order of the birds themselves. The photos themselves have been arranged by visual principle. So what does this mean? 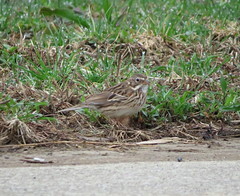 Let’s say that your looking up a particular sparrow. They will be organized by not just their shape but also their color. 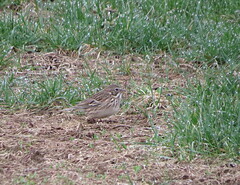 If looking up a Henslow’s Sparrow, they will have Le’Conte’s Sparrow, and a Grasshopper Sparrow on the same page for a side by side comparison, since they have similar characteristics. This is how they categorize their group of photographs. The rest of the Introduction goes over species arranged by Family, English and scientific names. color and plumage, voice, habitat, nesting, range and range maps round out the remainder. The next portion of the guide are the actual photographs of the birds. And yes they were right in the the quality of the pictures. They are wonderfully done, with the majority of the pictures being the male bird. Now they do show females and winter plumage birds when it’s necessary, but not with every bird. Believe it or not I do run into female birds. Now what do I do when I come across a female Blackburnian warbler? Here lays one of the problems with this guide. Another problem I’ve encountered is having to turn to the back of the guide to read the description, or look at their rather small, black and white range map (which I don’t like). And another issue I have with this guide, field marks. Let’s take for instance the Chuck-will’s-widow. The picture is superb, but the bird is blending in so well with the rest of the surroundings, it get’s lost. 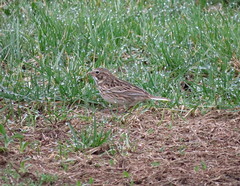 Nor does it show the white edges of it’s tail feathers, which is an identifier. It’s these little things that annoy me about this guide. The rest of the guide are all the descriptions, and range maps (which aren’t even color). Now the range map is probably the worst part. I just measured the map of North America in the guide, and it measures out to be 1 inch by 1 inch. I wear reading glasses for crying out loud! They use black lines that run it a specific direction to signify breeding, winter, and permanent range. Now try to decipher that on a wet and windy day by Lake Erie. Give me color any day. At least I can tell the difference between pink and blue even without my glasses. To wrap up this review, even though I’m not a fan of this field guide, the reason I bought it was for the color photographs. They are beautiful, and a very good reference for new birders. But with the internet these days, looking at photos of your favorite bird in various poses is only a click away. I feel like this guide has had it’s day. There are so many better guides out there, that the only reason to pick one up would be if it’s on sale, or at a garage sale. This one is definitely not field worthy. Stick with your Peterson or Sibley. A Field Guide To Warblers of North America, by Jon L. Dunn & Kimball L. Garrett. With illustrations by Thomas R. Schultz & Cindy House. First, I don’t want to lead the reader of this column to think that this is a field guide by Roger Tory Peterson. On the contrary, this is another addition to his field guide series. And at 656 pages this is one hefty book. If you had to buy one book about warblers in general, this is the book for you. After the Introduction, the book goes into “The Natural History of Warblers”. This section I feel is a little short in length, but covers all the important characteristics of the 18 different genera of warblers discussed in the book. Besides the 18 different genera that are described, they go into detail about species limits, hybridization, geographical variation, plumage and molts, habitats, foraging and food,vocalizations, behavior, breeding biology,migration and vagrancy, and finally conservation. And if that wasn’t enough they talk about their research methods in putting this all together. As with most field guide they educate the reader as to how to use the book. So for each species they will cover the usual items, similar species, voice, habitat, distribution, etc. etc. Then it’s onto the color plates of each different warbler species. They do a good job at covering every bird whether it’s a male of female. They also have plates for first spring male and female, and fall variations. Granted warblers can certainly get confusing when the seasons change, and all this is of great benefit for us birders, but they seem to cram a lot of birds on one page. One page alone, showing the plates for the Tennessee & Orange-crowned Warbler had 17 different drawings. 17! It made the page a bit busy. Not saying that it’s useful, don’t get me wrong, but they could have spaced it out a little. At 656 pages what’s a few more. Maybe making the plates of the birds larger would help us older citizens who have to wear glasses to see close-ups. I realize that they put a fair amount of effort into the plates, but Peterson’s pictures are far more superior. I’m rather partial. There is one part of the book I really love. I mean it. What I discovered while I was birding for warblers at Magee Marsh this last spring was that you spent an enormous amount of time looking up. I think the call it “Warbler Neck”. Besides seeing the belly of the bird, you also get to see the under side of the tail. So they included that little part in this guide. You need every bit of help you can get to identify a bird species, and this covers the bill, or tail, so to speak. Needless to say I like it. And you will as well. The bulk of the rest of the book is the “Species Accounts”. They take each genus and describe all the warblers in that genus. With each different warbler species, they give a general overview of the bird before they go into detail their description, voice, behavior, habitat, distribution, status and conservation, subspecies, taxonomic relationships, plumage and molts, and references. They also show one or two color photographs, as well as a nice range map. This section is done very well, and I’m impressed by it. It’s not the kind of guide that I would take into the field with me, but I feel that it is an excellent field guide for our warbler friends. A great piece of reference material that I would recommend to anyone who wanted to increase their knowledge concerning warblers. Even though it says $20.00 as the price, I think I only paid $13.00 on Amazon. My very first bird guide I purchased as an aspiring new birder wasn’t something that required a lot of thought. 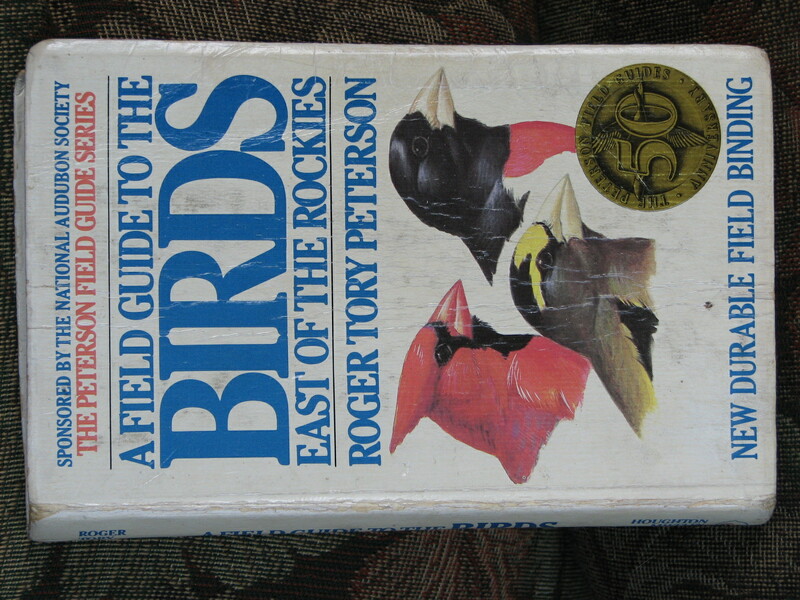 Kathy had in her possession during our early years was a signed copy of “A Field Guide To The Birds East Of The Rockies”, by Roger Tory Peterson. My wife had borrowed it, and it just never made it back to it’s rightful owner. After a few years it was eventually returned to him. That’s my first exposure to Roger Tory Peterson. Here it is. 384 pages of what I still think is the gold standard that every other field guide wants to become. As you an see, my own personal copy has been loved to the point as to resemble a old wallet you just can’t depart with. And with the added feature of a “New Durable Field Binding”, it has held up to the test of time. So Les, why do you pick Peterson over all the other authors of field guides? I think I can sum it up in 3 words. The art work. I love his representation of what a bird should look like. As he states in the Introduction of the Field Guide, “A drawing can do much more than a photograph to emphasize the field marks”. As a new member into the world of birding I needed all the help I could get. Not having any friends who had the same passion, I had to rely on my literary friend. The pictures haven’t changed over the years and it’s still divided into families as all other field guides. It has a check list area in the front of the book for easy reference. Not sure if you have a Sanderling, check the list. Very convenient, unless you forget to update it. I like how he uses an arrow to highlight field marks on the bird. This helps reenforce for the beginner the importance of field marks. His descriptions are exact for both male and female, and his inclusion of similar species as reference is a valuable tool. As with any field guide I’ve always had a difficult time deciphering what a birds voice sounds like by reading someones written description. Maybe I’m just stupid, but give me a recording of a particular bird and I’m able to remember that far more easier. With access to a computer with internet you will be able to find every bird call you want. That’s why I use Macaulay Library’s Database of bird calls as one of my primary resources. Range maps are pretty much like every other range map, except they are nice and big. Unfortunately, their in the back of the book. I wish they had figured out how to put the maps with the birds like his later editions. But if doing this takes it out of the classification of being a pocket reference, because it makes the book bigger, then I’m OK with that. I still wish it was by the bird picture. Overall I really love this field guide, and for $11.95 how can you go wrong.